Next step comms, else I am running blind and as my electronics knowledge/skill has "issues" that would be bad! Documentation shows that getting data from the Teensy 3.0 is really easy. Just set up the port and start writing to it! open the serial monitor from inside Arduino and listen. // Teensy 3.0 has the LED on pin 13 **THAT'S PIN 13 !! NOT 11 or 12 PIN 13! ARE YOU LISTENING?! // initialise the digital pin as an output. Woo hoo! we have serial monitor but ... nothing is output. Now the default in Arduino was /dev/ttyS0 which seemed very reasonable. WRONG! The correct serial port was /dev/ttyACM0 which I could select from the Tools/Serial Port: menu. Opened the Serial Monitor and uploaded the code to the Teensy 3.0 and ... The serial monitor closed itself, but upon re-opening it manually there were my messages every time the flash cycle repeated! I just need to find the "Keep Serial Monitor Open" or "Open Serial Monitor when deploying code" option. None exists and appears to be a major bug bear to many people. Although you can fix this in the open source Arduino its not going to fixed in the release version due to cross platform compatibility. OK OK. So, how else can we get the data from the Arduino? Some kind of timeout meaning it was easier to manually kill it and start a new instance. But even that did not capture the first message. Now to get the Teensy working in linux. I downloaded the Arduino software for linux and unpacked it then ran Teensyduino and selected the Arduino folder. The gentoo emerge arduino version did not work (and is noted on the Teensy website, my bad. and the blink code from windows was running without having to press the button. Unable find Teensy Loader. Is the Teensy Loader application running? And I managed to upload the default Blink sketch code targeting an older board *AGAIN* so sat looking at a non blinking Teensy. Followed my own advice and *READ* the comments, updated the pin number for the LED to 13 and away we go! This is great, I was really worried that linux based development just would not be possible especially with gentoo after the notes at Teensy. Stage one of my plan to overthrow all the worlds governments is complete only 64,599 steps to GO! FYI, future uses of Arduino automatically started the Teensy Loader auto-magically. 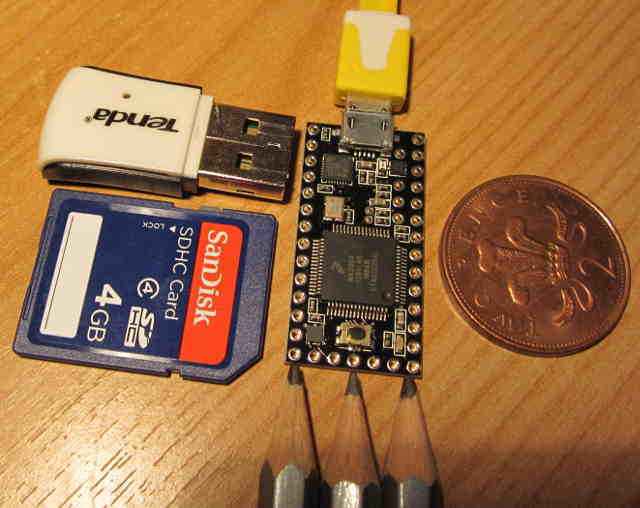 Earlier in the year I purchased a Teensy 3.0 a tiny (really small) micro-controller board. The truly amazing thing about the Teensy is not the size but the price. Just $19, but having it shipped to the UK was another $10 but that's still less than £20! So that's not even as wide as three standard HB pencils and conversely not as long as the width of six standard HB pencils. There is some somewhat confusing documentation, but to get it working out of the box (it came in an anti-static bag) just plugin it in to a USB micro B cable(not supplied, these come with every non apple mobile phone) and connect a power source (i.e. a computers USB socket). The board will the blink and that blinking is the code that is pre-loaded onto the system. I wanted to get something slightly more interesting on the board and to do it from Linux but the system was busy and I had a Windows laptop lying idle. To get your own code onto the Teensy you need the open source Arduino software, which you just extract from a zip and then install the Teensyduino. This process is simple, just point at the folder where the Arduino files were extracted and it will do its thing. I had to run as Administrator to get it to install a virtual COM port. Then run Arduino select the board as Teensy 3.0 (tools menu) and load one of the examples (File/Examples/Teensy). The Tutorial section of the Examples has (unsurprisingly) a Blink file, but running this produced no blinking! A quick glance at the comments at the top the file reveal that the hardware address for the LED is different for each version of the Teensy. Updating it from 11 to 13 and running again got me my blink back. The Blink code is; a simple setup; loop forever; with delays turning on and off the LED. I changed the first delay from 1000 to 3000 and now the board blinks on for three seconds and the waits just one second while the LED is off and then turning back on for three seconds ad infinitium. Found this blog post about Attributing Potentially Malicious URLs and picked up a tip that I thought was impossible. Using bing.com with the query ip:82.165.83.145 where 82.165.83.145 is the server hosting www.jumpstation.co.uk. The search results will be ALL the domains hosted on that IP address. Wonder how they do it ? !